Dimensions : 91.5 h x 44 w x 39.5 d cm. Original : private collection, Norman manor-house (France). 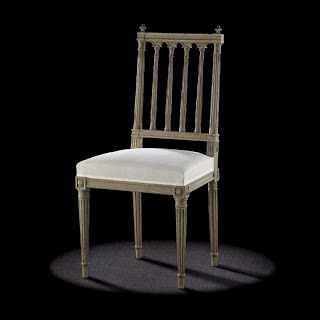 A lighter version of the chairs with detached columns, in other words with a tableau back ornamented between the uprights with columns, this model is also known as "cathedral" due to the design of the back. 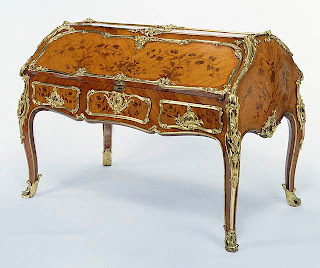 The moulding and the fluted, covered legs come from the repertoire of the late Louis XVI style chair; the ends of the stiles, the low rosettes on the knees and the flat fretels decorating the tops of the columns should also be noted. 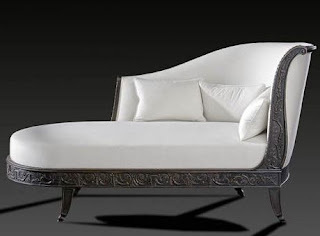 This antique French furniture model is the exact copy of a pair of chairs belonging to in a Norman manor-house.